The 2017 British Grand Prix (officially the 2017 Formula 1 Rolex British Grand Prix) was the tenth race of the 2017 Formula One season, the seventy-second time the British Grand Prix was held, and the fifty-third time it was held at the Silverstone Circuit. It was held between 14 July and 16 July 2017. In qualifying, Lewis Hamilton took his fifth British Grand Prix pole, equaling Jim Clark's number of five poles at the British Grand Prix. Kimi Räikkönen joined him on the front row, outqualifying his teammate Sebastian Vettel for the third time of the season. The race featured Hamilton racking up his fifth career Grand Chelem in a Mercedes. Teammate Valtteri Bottas drove an inspired race to come back from his grid penalty to take second, ahead of Ferrari driver Kimi Räikkönen. Championship leader Vettel had tyre issues late in the race, dropping him to seventh and reducing his points lead over Hamilton to just one. In attempts to make the open cockpits more safe for 2018, a "shield" cockpit protection was tested by the Ferrari during the first practice session. Sebastian Vettel ran one lap with it installed, and immediately returned to the pits, saying it made him feel "dizzy". On 13 July, Toro Rosso were summoned by the stewards after they found out that Carlos Sainz, Jr.'s car was considered to be in an unsafe condition. During the weekend, one of the pit garages were used to present life-size models of Lightning McQueen and Jackson Storm from the Disney/Pixar film Cars 3, as part of a promotion by Disney and the Formula One Group to promote the movie's UK release. Hollywood actors (and race fans) Owen Wilson and Woody Harrelson were also on hand for the promotion events. Following the session, Bottas' gearbox was changed. Like with Hamilton's unscheduled gearbox change in Austria, Bottas did not meet the six consecutive Grands Prix before the allowance of a new gearbox, therefore receiving a five-place grid penalty. On Saturday, Daniel Ricciardo was confirmed to take an unscheduled gearbox change as well, also meaning a five-place grid penalty. Fernando Alonso was also confirmed to start from the back with multiple grid penalties for having additional power unit components fitted to his car. Haas-Ferrari 1:32.031 16 DNP 22 ! DNP 22 ! * Bottas was given a five-place grid penalty for an unscheduled gearbox change. † Alonso was given a thirty-place grid penalty for using an additional engine, turbocharger, MGU-H, MGU-K and Energy Store. ‡ Ricciardo was given a five-place grid penalty for an unscheduled gearbox change. Stoffel Vandoorne's 10th start (11th entry). Kevin Magnussen's 50th start (51st entry). Pascal Wehrlein's 30th entry (29th start). Carlos Sainz, Jr.'s 50th entry and start. Max Verstappen's 50th entry and start. Lance Stroll's 10th entry and start. 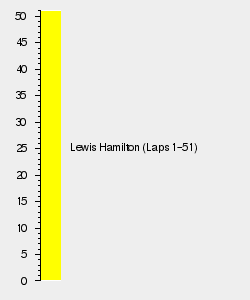 Lewis Hamilton's fifth British Grand Prix pole, matching him with Jim Clark. Hamilton won his fifth British GP, putting him equal with Clark and Alain Prost. Hamilton also racked up his fifth career Grand Chelem, putting him equal second with Alberto Ascari and Michael Schumacher. ↑ "2017 Formula 1 Rolex British Grand Prix". formula1.com. Formula One Administration. http://www.formula1.com/content/fom-website/en/championship/races/2017/Great_Britain.html. Retrieved 14 July 2017. ↑ Noble, Jonathan (8 July 2017). "FIA reveals first image of shield device and British GP test plans". autosport.com (Motorsport Network). http://www.autosport.com/news/report.php/id/130613/shield-device-set-for-first-run-at-british-gp. Retrieved 14 July 2017. ↑ Noble, Jonathan (13 July 2017). "Toro Rosso F1 team summoned to stewards over 'unsafe' Sainz car". Autosport (Motorsport Network). http://www.autosport.com/news/report.php/id/130699/toro-rosso-summoned-over-unsafe-sainz-car. Retrieved 14 July 2017. ↑ Wood, Ryan (14 July 2017). "Disney Pixar teams up with Formula 1 to launch Cars 3". Motorsport Week. https://www.motorsportweek.com/news/id/15300. Retrieved 16 July 2017. ↑ 5.0 5.1 "Bottas braced for Silverstone gearbox penalty". formula1.com (Formula One Administration). 14 July 2017. https://www.formula1.com/en/latest/headlines/2017/7/bottas-braced-for-silverstone-gearbox-penalty-.html. Retrieved 15 July 2017. ↑ 6.0 6.1 "Ricciardo to drop five grid places after gearbox change". formula1.com (Formula One Administration). 15 July 2017. https://www.formula1.com/en/latest/headlines/2017/7/ricciardo-to-drop-five-grid-places-after-gearbox-change.html. Retrieved 15 July 2017. ↑ 7.0 7.1 "Alonso to start from back of grid in Great Britain". formula1.com (Formula One Administration). 15 July 2017. https://www.formula1.com/en/latest/headlines/2017/7/alonso-to-start-from-back-of-grid-in-great-britain.html. Retrieved 15 July 2017. ↑ "2017 British Grand Prix – Practice 1 results". Formula1.com (Formula One Administration). 14 July 2017. https://www.formula1.com/en/results.html/2017/races/968/great-britain/practice-1.html. Retrieved 14 July 2017. ↑ "2017 British Grand Prix – Practice 2 results". Formula1.com (Formula One Administration). 14 July 2017. https://www.formula1.com/en/results.html/2017/races/968/great-britain/practice-2.html. Retrieved 14 July 2017. ↑ "2017 British Grand Prix – Practice 3 results". Formula1.com (Formula One Administration). 15 July 2017. https://www.formula1.com/en/results.html/2017/races/968/great-britain/practice-3.html. Retrieved 15 July 2017. ↑ "2017 British Grand Prix – Qualifying results". Formula1.com (Formula One Administration). 15 July 2017. https://www.formula1.com/en/results.html/2017/races/968/great-britain/qualifying.html. Retrieved 15 July 2017. ↑ "Britain Grand Prix 2017 Race Results". formula1.com (Formula One Administration). 16 July 2017. https://www.formula1.com/en/results.html/2017/races/968/great-britain/race-result.html. Retrieved 16 July 2017. ↑ 13.0 13.1 Collantine, Keith (16 July 2017). "2017 British Grand Prix championship points". F1 Fanatic (Keith Collantine). http://www.f1fanatic.co.uk/2017/07/16/2017-british-grand-prix-championship-points/. Retrieved 17 July 2017.